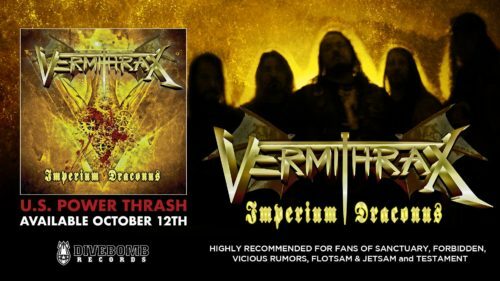 Published on September 20th, 2018 | by Justin G.
Divebomb Records will be releasing the debut full-length album from Pittshburgh-area thrashers VERMITHRAX this October. Striving to resuscitate the aggressive, driving metal of the mid-’80s thrash scene, VERMITHRAX was forged in “Steel City” Pittsburgh, PA during 2012 by vocalist Chris “Croy” Roy (Reading Zero, Emancipation) and drummer J.R. Jameson (Nunslaughter, Icarus Witch, Mercenary). 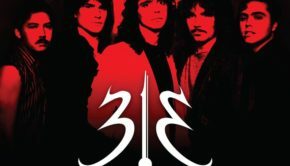 Joined by guitarist Scott “Hagz” Haggerty and bassist Tom Donaldson (Mercenary, Eye) to round out the lineup, the quartet issued its debut EP, Volume 1, which was met with immediate praise—the metal press hailing the band’s deft blend of progressive and thrash elements, thundering drums, shredding solos, as well as Croy’s multi-faceted vocals. 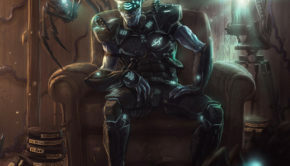 Sharing the stage with such heavy-hitters as Iced Earth, Metal Church, Queensrÿche, Fates Warning, Overkill, Sabaton, Lizzy Borden, While Heaven Wept, and Evergrey has aided VERMITHRAX in sharpening their skills in preparation for their sophomore outing, Imperium Draconus—recorded at the band’s personal studio, The Lair, and mixed in part by Christopher Lee Simmonds (Thought Industry, Filter, Emancipation Syndicate) and Jim Dofka (Dofka, Psycho Scream, etc.). 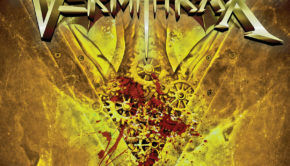 The anthemically epic vibe of “Enoch” and brooding chug of “Crucified by Hate” are definitive emblems of VERMITHRAX’s balanced yet varied approach—their classic metal-inspired sound featuring an array of blistering guitar solos and animated, identifiable vocals. “Road to Athkatla” emerges as the album’s razor-sharp foray into the adventurous worlds of progressive and power metal; while “River Crour” immediately breathes thrashing mad fire. 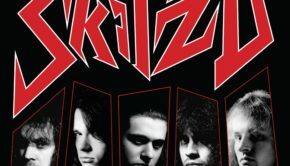 Written as an homage to Slayer’s Jeff Hanneman on the day he passed, it lends the perfect counterbalance to the intricately nuanced yet powerful “Spellbound” and the pummeling, prog-tinged driver, “Calling My Name.” The disc closes with a steamrolling thrasher that combines VERMITHRAX’s unique approach branded deep into a medley of two Flotsam and Jetsam staples—”Hammerhead” and “Hard on You”—as a heartfelt tribute to one of their favorite classic thrash influences. With Imperium Draconus, Divebomb Records is proud to assist VERMITHRAX in igniting the world with their fiery brand of progressive-and power metal-infused thrash!